In the 1980s, the Oracle of Omaha invested in a mega-trend, turning $600 million into $16.4 billion. China’s aging population, environmental challenges and rising middle class are trends to watch. 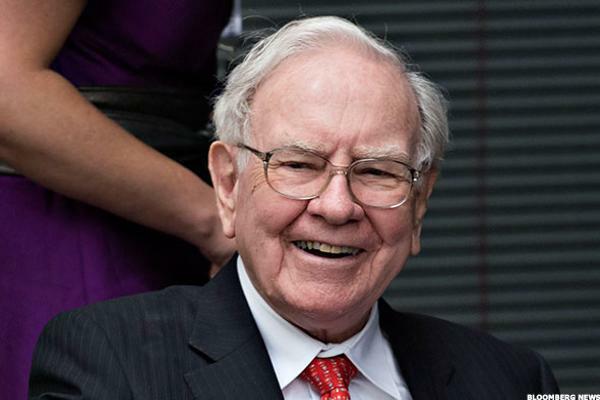 If there is one thing we know from iconic billionaire and investor Warren E. Buffett, it is that getting on the right side of a big trend can be very profitable. In the late 1980s, he thought that the soft-drink industry was about to be the next big thing. Taking advantage of the opportunity, he invested 25% of the assets of his investment firm, Berkshire Hathaway — about $600 million at the time — into Coca-Cola shares. Since then, the value of that stake has turned into $16.4 billion. Buffett’s strategy shows that anticipating big global trends can lead to big profits for investors. In an interview with Forbes magazine, he said that Coca-Cola shares at the time didn’t reflect the potential for huge growth that was set to occur in the company’s international business over the coming decades. Buffett’s strategy of holding a small number of very profitable ideas in his portfolio goes against the common investment principle of diversification, but when applied correctly, it can generate huge returns. World-renowned investor Jim Rogers said in an interview that he also likes to put all his eggs in one basket. 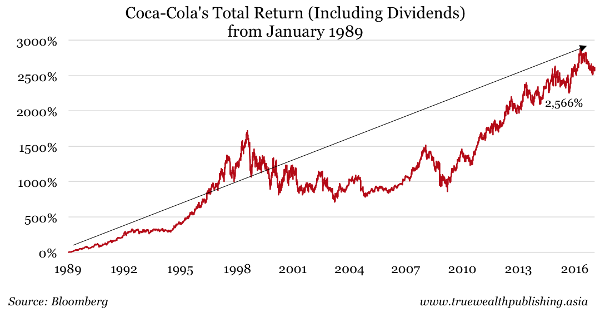 Those who had purchased $20,000 worth of Coca-Cola stock in January 1989 and held the shares would have an investment including dividends worth more than $510,000. That is a return of 2,566%, as shown in the chart below. Investors often follow short- and medium-term moves in stocks and bonds for a quick win, but as Buffett’s investment strategy shows, success comes over time, not overnight. Anticipating long-term trends, the kinds of changes that take place over many years, is the secret to bigger investment gains. Buffett has built a career and fortune on this simple but difficult-to-execute idea. First, he identifies great businesses with a strong likelihood of profiting from long-running trends. Then he focuses on those businesses and rides the wave for as long as possible. Buffett predicted a powerful, long-running source of demand, in this case, that a mega-trend of accelerating soft-drink consumption was unfolding around the world. There were huge, untapped markets in Africa, China and the Soviet Union. Hundreds of millions of people in these emerging markets had never tasted a sweet carbonated beverage before. Looking forward, it was easy to envision Coca-Cola — the premier soft-drink brand — experiencing long-term growth in these areas. So the questions are: What is the modern equivalent of Coca-Cola in 1989, and which companies and industries will grow with the mega-trends of the future? One clear difference between now and the 1980s is that the global center of capital is shifting. In the 1980s, the U.S. was the center of the investment universe. Now, the axis of global growth is moving east. By 2025, Asia’s economies will be larger than those of Europe and the U.S. combined. Here are three China mega-trends that will offer huge opportunities for investors. 1. Urbanization and rising middle class. China’s transformation from a rural society to the world’s second-largest economy has happened in less than a generation, and the process is far from complete. Rapid economic growth has led to a huge increase in rural to urban migration. About 56% of China’s population lives in cities, up from 26% in 1990. But China is still some distance behind the U.S., where that figure is about 80%. 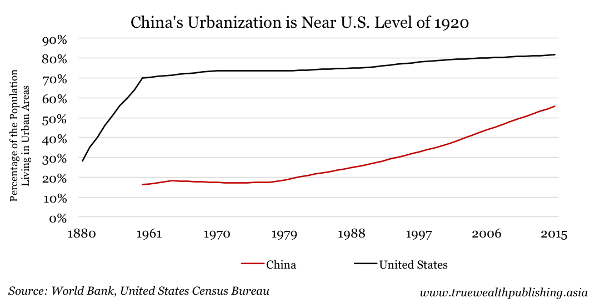 China’s urbanization level is close to where the U.S. was in 1920, as the chart below shows. This cocktail of development, economic growth and urbanization has created a huge middle class in China. And middle class people are spending their rising incomes on goods and services both in China and overseas. China’s bulging middle class will drive the growth of many industries, including insurance, technology and travel. The country’s population of 1.38 billion is more than four times greater than that of the U.S. As China evolves into a developed economy, the absolute size of its consumer markets will be much larger than that of the U.S.
Treasuries rose while the dollar pared gains as the latest jobs report showed weakening wage growth even as hiring increased, giving the Federal Reserve room to keep rates low. The yield on 10-year Treasury notes fell three basis points, while Bloomberg’s Dollar Spot Index erased a gain. 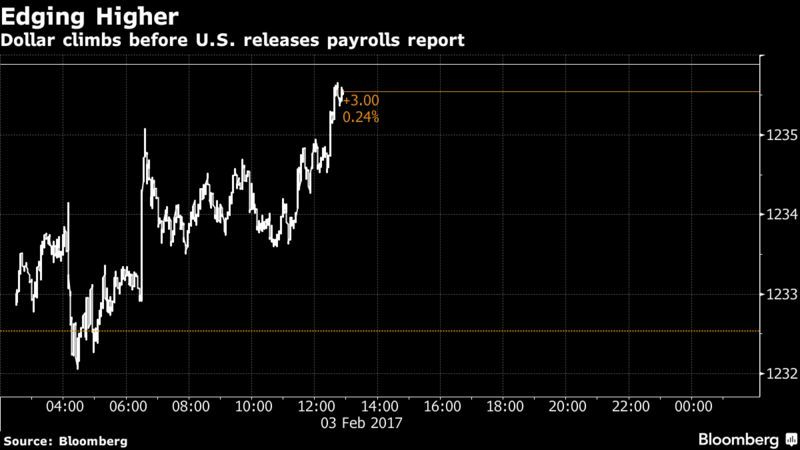 Futures on the S&P 500 Index added to an advance at 8:32 a.m. in New York. Europe’s Stoxx 600 index advanced and the region’s bonds dropped. U.S. employers added the most workers in four months while wage growth slowed more than projected, suggesting there’s still some slack left in the labor market. The data cap a week that’s seen monetary policy makers in Japan, the U.K. and the U.S. stand pat as they assess the impact of America’s new leadership on global growth. One of the busiest periods of the earnings season also brought mixed signals, even as signs increasingly point to growing confidence among consumers and businesses that American growth is poised to accelerate.